The Regner 25460 Vincent is a gas fired single cylinder overtype locomotive with a flywheel and a chain drive to a geared chassis. Fitted with a reversing lever on the cylinder block, a displacement lubricator, a lever operated regulator, a pressure gauge, water level gauge and a water top up system. The wheels are insulated and gauge adjustable. The figure is not included. The buffer couplings are compatible with LGB and Piko rolling stock hook and loops. 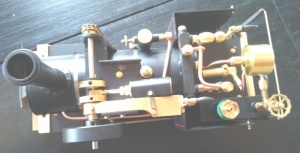 A whistle kit 20209 is available for Vincent and can be ordered separately for you to fit, or we can fit one for you when you order the loco, by ticking the box above. When I fit the whistle it will be mounted under the floor between the wheels, the whistle valve will be fitted in the cab in a vertical port. We can also fit a Summerlands Chuffer to Vincent and although it's an oscillating engine it will greatly accentuate the exhaust. Please be aware any of the fitted by us options may delay delivery and the parts are subject to availability if we think there will be a significant delay we will email you. Regner no longer provide tool kits in with their engines, even though it may say so in the instructions. If this is your first Regner engine we recommend you buy the starter set 25410 which is available for £28 ( normally £31.30 ) when bought with this engine. If you use a Ronson gas can adaptor and you want this engine fitted with a Ronson gas tank filler valve please tick the box and we will fit one for £12 extra. Working pressure: 3bar. Length: 270mm. Width: 110mm. Height: 160mm. Weight: 1877g.